The theme for the weather in the days before the February "winter" meet was one of warmth, wetness, and rapid snow melt. 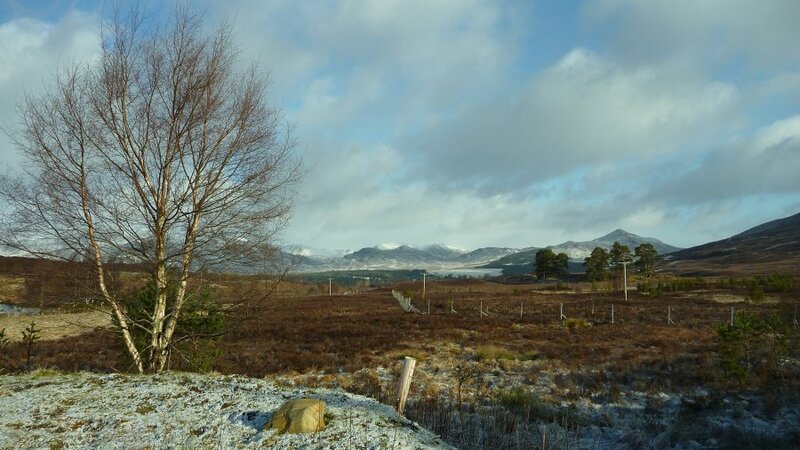 Then as the weekend grew close, the Met Office issued a weather warning for heavy snow and storm force winds. So a typical trip to Scotland then. Carmen wanted to get some Munros bagged, but has done everything within striking distance of Laggan (the Raeburn Hut), so we drove up a day early to Arrochar. Here we made an Alpine start for a walk up Beinn Narnain and Ben Ime, in normal Autumn conditions – mild and cloudy but with a cold wind on the summits and a thin covering of snow over the highest tops. The forecast was for heavy rain later in the day (hence the early start), and it wasn't wrong, luckily it waited until we were in the car. We met up with the others at the hut that evening, and made some half-hearted plans for the next day, safe in the knowledge that they'd be scuppered by the weather. But Saturday morning brought blue sky and sunshine, so we had to go out and do something after all. Peri, Antony, Jamie and Paul headed for the trip of Munros south of Loch Laggan. I was dying of man flu, so Carmen and I opted for a low-level walk from the hut to look at the Dirc Mhor (a ravine caused by a landslip on The Fara). Will and Rob decided on the east ridge of Beinn a' Chaorainn (grade II), as if the blizzards did show up it should be a bit sheltered from the westerly winds. Of course the weather didn't disappoint, and Carmen and I were soon battling into strong winds and horizontal snow along the glen. Being quite low down though, we did get the benefit of a few breaks, with some fine views and even sunshine. It was a bit of a soul-destroying slog thgrough heather and tussocks for the last 3 miles, but we eventually reached Dirc Mhor, and had a brief look at the ravine before it disappeared into another snowstorm. We walked up the Dirc Beag (a companion landslip) and then back over the summit of Meall nan Eagan (just 658m but hard to stand upright in the wind). The Munro-bagging posse meanwhile had persevered to the summit of Creag Pitridh before seeing sense and saving the other two summits for another less exciting day. Quite impressive they managed to get as far as they did! Will and Rob completed their route, despite serious doubts at the foot of the ridge as to whether they should continue. "A very wild day with gusts of about 70-80mph and tons of spindrift. The ridge itself is very nice," said Will. "Wild, crawling along some sections, we played making it hard at start and then got a shift on, no cornice where ridge meets top. bearings off top in gusty conditions," said Rob. Will's brave decision to wear brand new plastic boots then led to a slow descent and a return to the hut a few hours after dark. Sunday was due to be the best day of the trip, and so it turned out with bright sunshine and clear blue skies. 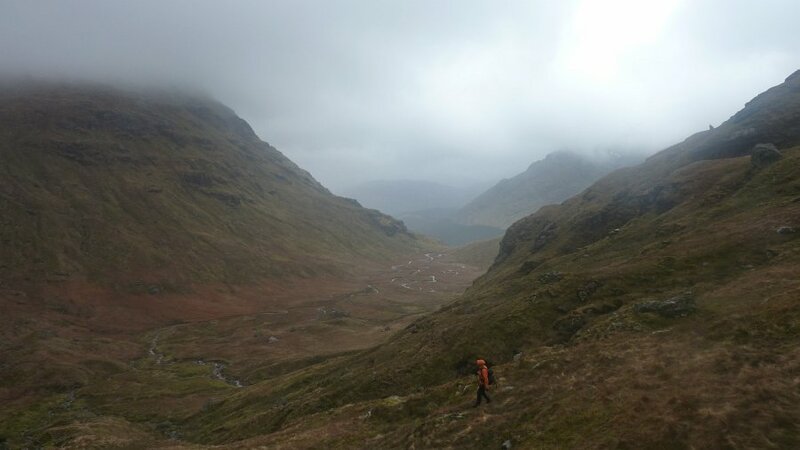 Will was still crippled, but equipped with Rob's spare boots and several pairs of socks managed to join him to bag a couple of Munros near Roy Bridge – Stob Coire Sgriodain and Chno Dearg. Carmen and I meanwhile headed for the route they'd done yesterday, the east ridge of Beinn a' Chaorainn – my man flu had subsided but I still didn't fancy anywhere with a long walk in. Conditions were brilliant, sunshine and gentle winds, a quick walk through the forest being eventually slowed by deep powder on the approach to the ridge. The route itself was great, several tricky options available (most of which we took), with easier alternatives (though still quite serious with some big drops). As expected, the rope we'd brought "just in case" stayed in the sack all day. The sunshine eventually succumbed to approaching cloud, and the summit was in the clag, but the day was so good (and the hour so early) that we decided to add a few miles to the day by completing the horseshoe to the east and going to the summit of Creag Meagaidh. This was my 3rd visit, but the 1st where the summit was actually visible! A long descent down the south ridge took us back to the car. Despite the fine weather, we had the hills to ourselves, apart from 2 skiers we saw in the distance. 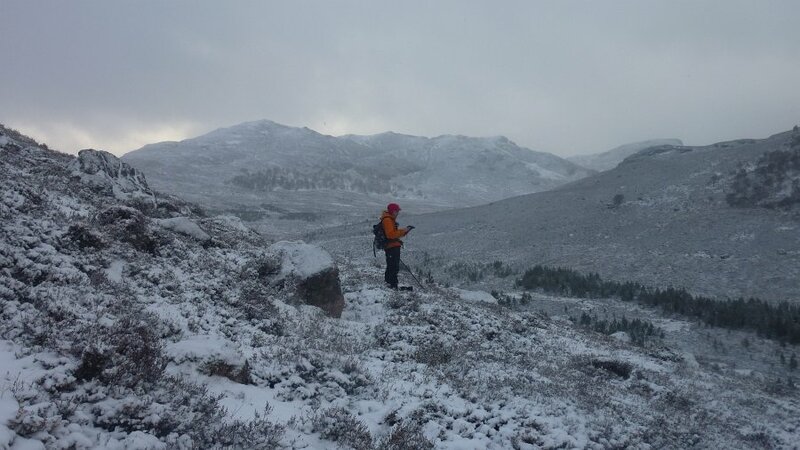 Monday was due to be warm and wet again, but Rob had arranged a guide, so he and Will were up by 5am to try to get to the Northern Corries before the turbo-thaw hit, which they managed with a quick ascent of Droidless (VI 6). 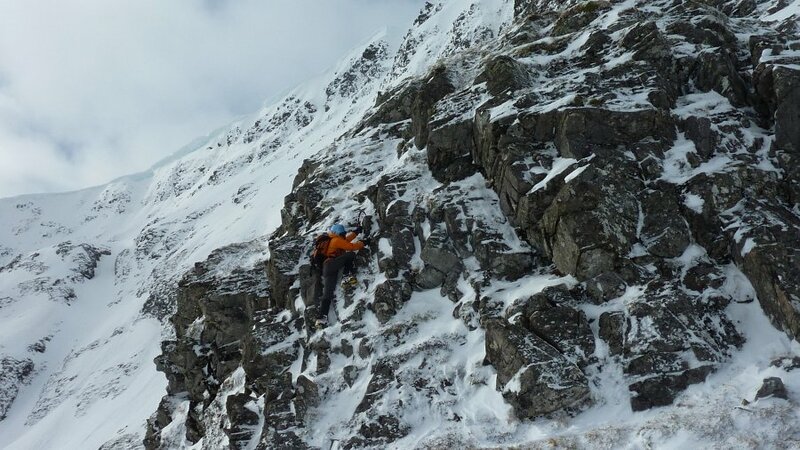 "Full winter condition at start of first pitch, after which a spectacularly fast thaw stripped the rime completely by the start of the second pitch. The cracks were still icy on the third pitch so it still felt in winter condition overall. Very cold hands from the running water!". Also up an an ungodly hour were Paul and Antony, as they needed a lift to the Cairngorms from Will. 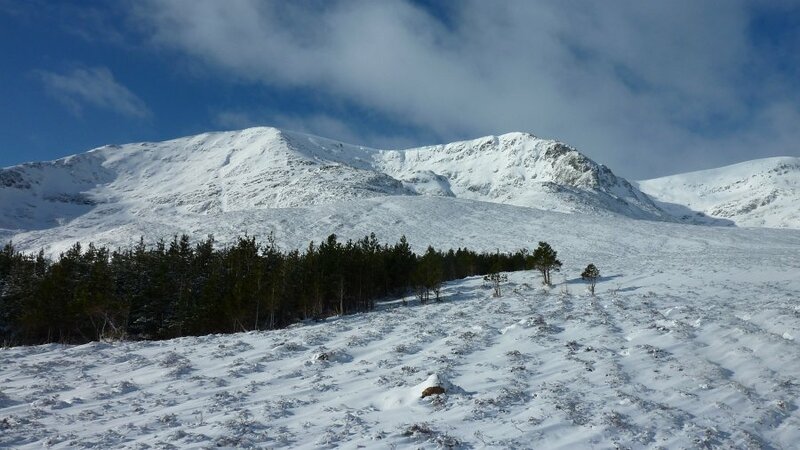 They made a brave attempt at Cairngorm via Coire an Lochain, but made a tactical retreat after being blown over a couple of times in fast-melting snow. The day was saved with some excellent cake at the cafe! 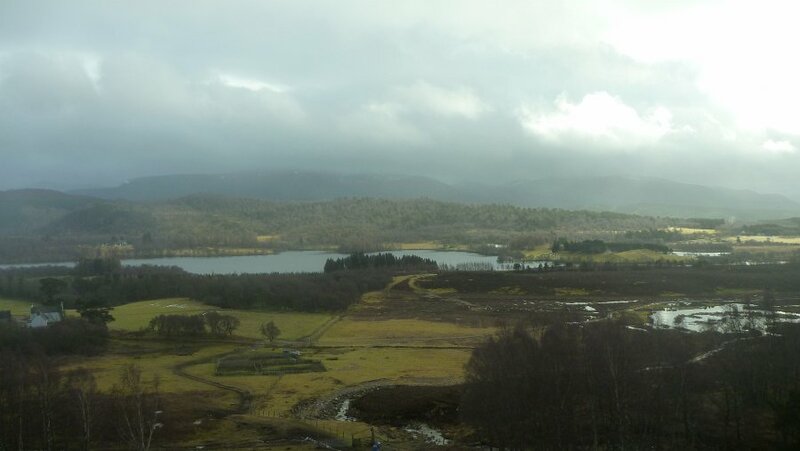 The sensible among us had a lie-in, followed by a token ascent of Geal-charn Mor, a Corbett near Aviemore, in the drizzle. Almost all the snow from the weekend had gone – winter was over again. 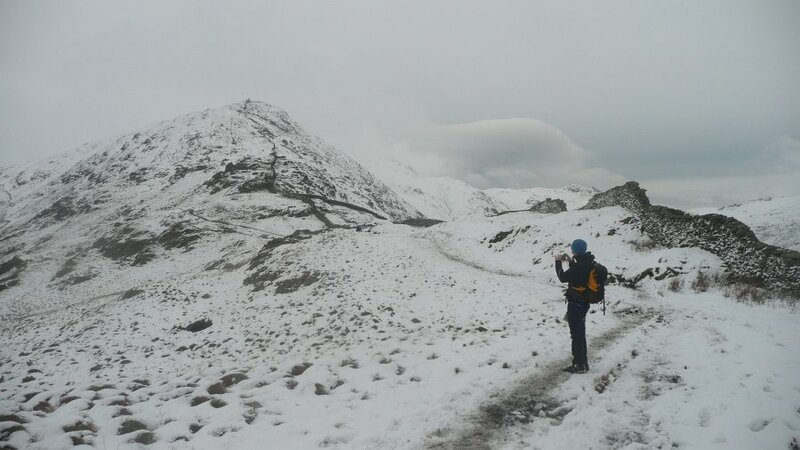 After a largely snow-free start to the year, a couple of days before the January meet we were treated to some heavy snow for the Lake District. 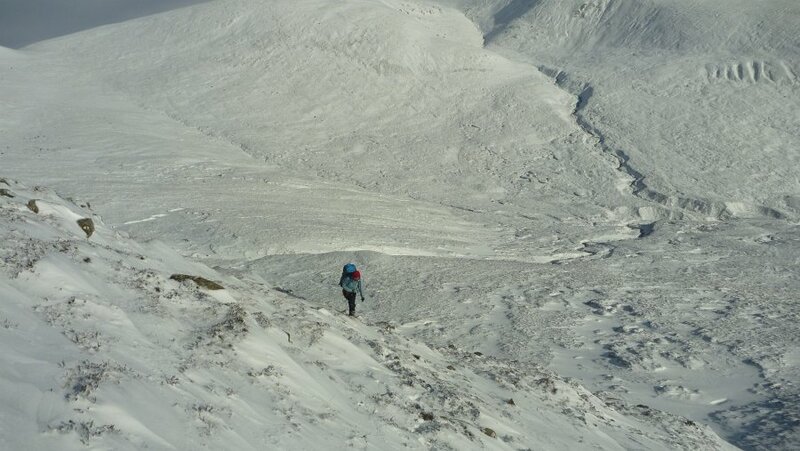 It hadn't been cold for long enough to give decent climbing conditions, but walking conditions were superb. Saturday was cold, bright and sunny. The mountain bikers chose to take advantage of this with a long cycle through the valleys. Rob and Carmen did a snowy scramble on Coniston Old Man, finishing at the summit, where they met up with Mike, Antony, and Dave for a walk over the rest of the Coniston range to Wetherlam, returning via valley paths to Walna Scar. I opted for a long run, the plan being to start up Coniston Old Man, cross the range before descending to Wrynose Pass, then up to Crinkle Crags and seeing how far I got before time ran out. 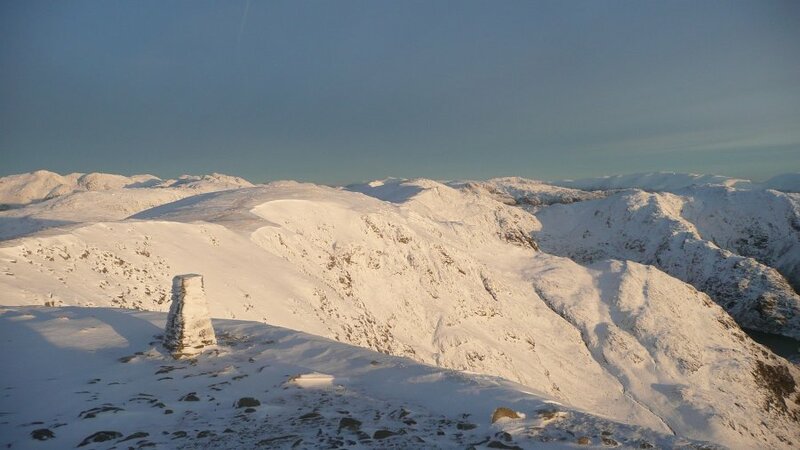 Fantastic running conditions on the Coniston hills were replaced by deep powder snow for the ascent of Cold Pike and the continuation to Crinkle Crags, slowing me to snail's pace. A brief attempt on the Bad Step was abandoned due to chest-deep drifts, a steep slightly worrying scramble to the left reached the crest again. 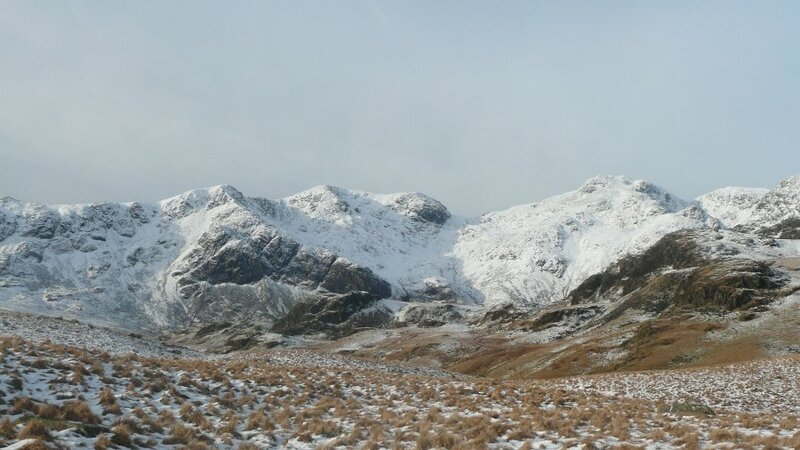 My original idea of continuing as far as Scafell Pike was by now abandoned due to the snow conditions, so I carried on over Bowfell before descending from Ore Gap into Eskdale and back down Moasdale to Cockley Beck. There was still plenty of time, and the weather was still good, so rather than heading down the Duddon Valley to pick up the Walna Scar road, I decided to head back for the tops. 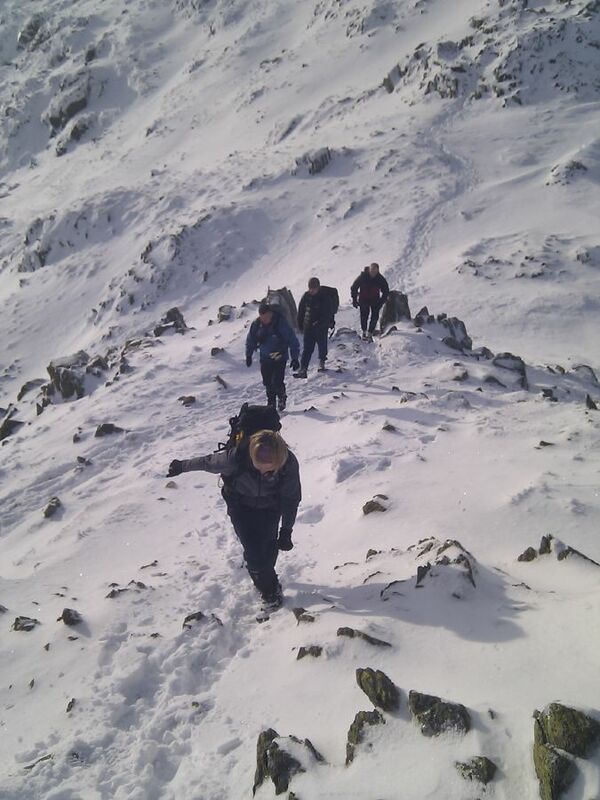 A long slog up Grey Friar led to a second traverse of the range, this time finishing at the col above Goat's Water. Thoughts of finishing over Dow Crag were abandoned as the light began to fail so I returned from here direct to the hut. A great day, even though the running element had finished at the Three Shires Stone! Sunday was much cloudier, but still dry. Carmen and I headed for Grasmere, where we did the Fairfield Horseshoe – unfortunately mostly in the clag. Most of the others were temporarily blocked in by Andrew's flat tyre and then Annie's car parked in the gateway, but Rob and Dave managed an afternoon ascent of Blencathra and the hills behind. Not sure what everyone else did, sorry! You are currently browsing the York Alpine Club Blog blog archives for February, 2012.